, who "hasn't marched anywhere yet," submitted this one. 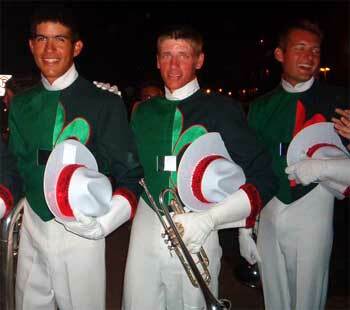 "Here's a picture of three Scouts from Indianapolis this past summer. I have no idea who they were, but in our excitement at running into them on the way back to the buses after retreat, we begged a picture and this was it. Then the lights turned green and there was such a crush of people going across the street, I didn't get their names. But perhaps someone can identify these guys. I'd love to know who these guys are, if someone identifies them!" Thanks Samantha!